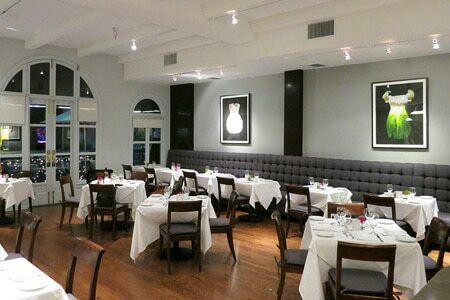 Elegant and tasty Italian home cooking in the heart of Beverly Hills. Lunch Mon.-Fri. 11:30 a.m-3:00 p.m.
: THIS RESTAURANT IS CLOSED Who could be more fit to run an Italian restaurant than a native of Venice? DOMA has entered into a new chapter with the expertise of general manager Stefano Ongaro. Ongaro is not a chef, but he learned to cook from the heart with his mother and grandmothers. It was his idea for this Beverly Hills establishment to focus on homier, comforting Italian cuisine, the kind he makes at home for his family. This is especially appropriate considering DOMA's owner, Sonja Perencevic (also the proprietor of the iconic Dan Tana's), named the restaurant after the Croatian word for “home.” The dining environment is at once modern and classic, elegant yet approachable, with grey and white tones, and eye-catching photographs starring vegetables on the walls. Ongaro and chef de cuisine Steven John Short have come up with a menu of tasty and uncomplicated dishes. Begin with the grilled flat bread topped with homemade mozzarella, fontina, rucola and cherry tomato. (Prosciutto can be added for an extra $4). We really liked the breadcrumbs that lightly coat the grilled wild calamari. More starters include the classic eggplant Parmigiana, farro salad and the insalata di pollo (pulled free-range roasted chicken on butter lettuce and endive). Choosing pasta is a dilemma, unless you are thinking of taking the leftovers home. Note that the homemade pappardelle Bolognese is a must-have. As we know, pizzas have a multitude of renditions. The ones at DOMA are on the top tier thanks to their fluffy crusts. Watch the chef preparing the gamberoni all busara (wild shrimp), and you will understand why they are good. If you have room left for only one meat course, don’t hesitate to go for the Milanese pork chop. End with the tiramisu or the chocolate soufflé, which comes with a raspberry coulis. 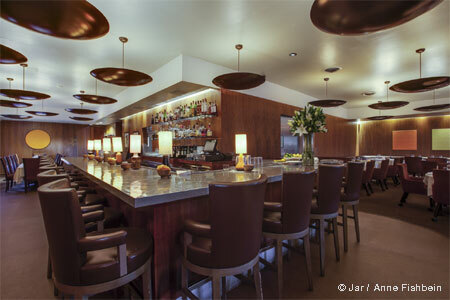 Before or after dinner, sip a signature cocktail at the bar where you can enjoy a view of the open kitchen and the space in between the tables that gives a real sense of luxury --- especially in the 90210 area. The wine list has labels from all over the world with an emphasis on Italy and California.